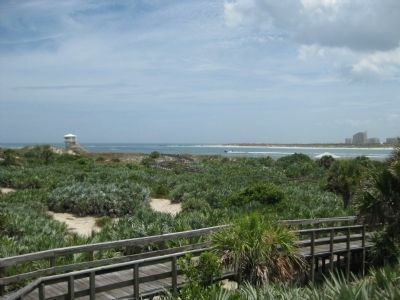 the Atlantic Ocean, and opposite New Smyrna Beach to the south of the inlet. Marker is at or near this postal address: 4931 South Peninsula Drive, Port Orange FL 32127, United States of America. Touch for directions. Other nearby markers. At least 8 other markers are within walking distance of this marker. 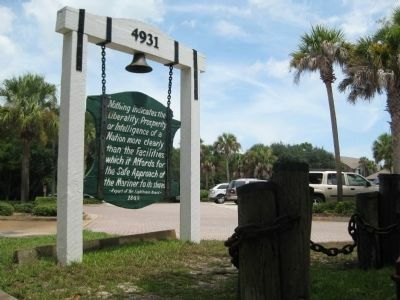 Kedge Anchor (within shouting distance of this marker); Oil Storage House (within shouting distance of this marker); 16th Century Anchor (within shouting distance of this marker); Bronze Bell (within shouting distance of this marker); Ponce Inlet Veterans Memorial (within shouting distance of this marker); Jesse Linzy (within shouting distance of this marker); Second Assistant Keeper's Dwelling (within shouting distance of this marker); Gladys Meyer Davis Home (within shouting distance of this marker). Touch for a list and map of all markers in Ponce Inlet. More about this marker. 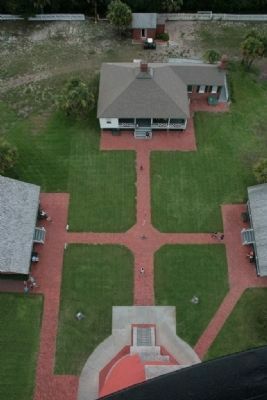 The plaques are mounted on the brick posts at the main gate into the Lighthouse Museum compound, facing the parking lot. 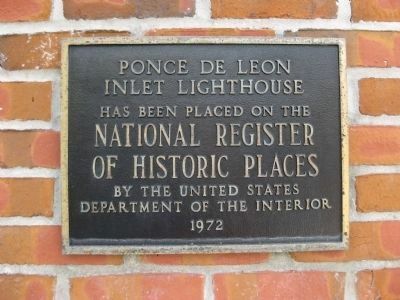 Regarding Ponce de Leon Inlet Lighthouse. 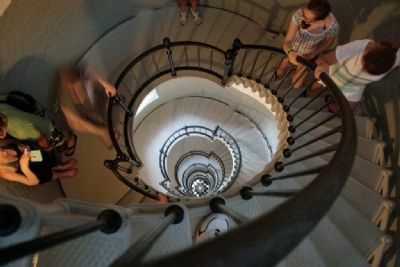 Built in 1887, the Ponce de Leon Inlet Lighthouse is the tallest lighthouse in Florida and the second tallest masonry lighthouse in the nation. 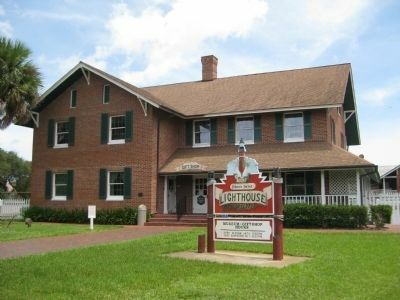 The lighthouse itself is accompanied by several support structures which now operate as museum and gift shop. The lighthouse was automated in 1953, but deactivated in 1970. 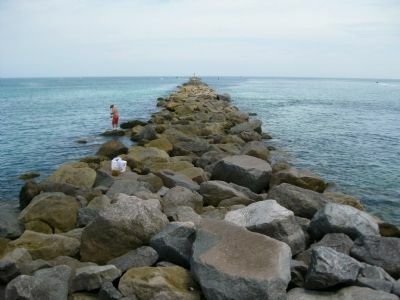 It was reactivated in 1982, after newly constructed high-rise buildings blocked the Coast Guard beacon on the inlet's other side. The markers are mounted on the two brick posts. — Submitted August 30, 2010, by Mike Stroud of Bluffton, South Carolina. "Nothing indicates the Liberality, Prosperity, or Intelligence of a Nation more clearly than the Facilities which it Affords for the Safe Approach of the Mariner to its shores." The lighthouse is seen towering in the distance. Viewed from the boardwalk at Lighthouse Point Park. 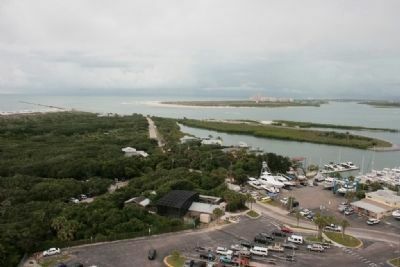 Across the inlet is New Smyrna Beach. 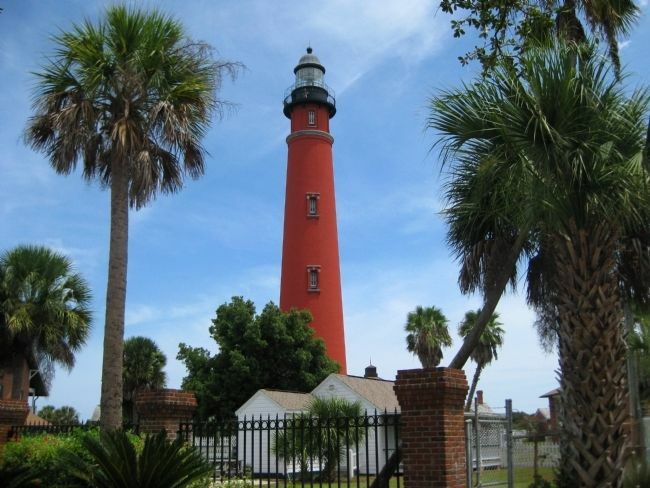 When the Mosquito Inlet Light Station (now Ponce Inlet) was first completed in 1887, the beacon was a fixed (non-rotating) First Order Fresnel lens manufactured in France by Barbier and Fenestre. This lens was actually made in 1867 and was kept in storage for nearly 20 years before being sent to the lighthouse here. It was lit by an hydraulic kerosene lamp with five concentric wicks, which created a 15,000 candlepower light that could be seen 20 nautical miles out to sea. The lens has five 45 degree panels that would have illuminated 225 degrees of the horizon. The silvered copper reflective panels at the rear of the lens functioned to increase the light. In 1909 an incandescent oil vapor (IOV) lamp was installed in the lens. The original kerosene lamp of 1887 was innovative for its time, but by 1909 the new IOV design was making the oil lamp obsolete. In 1933 the Bureau of Lighthouses decided to change the characteristic of the beacon from fixed and steady to rotating and flashing. The First Order fixed lens was removed and shipped to the Coast Guard's Seventh District Supply Depot in Charleston, South Carolina. 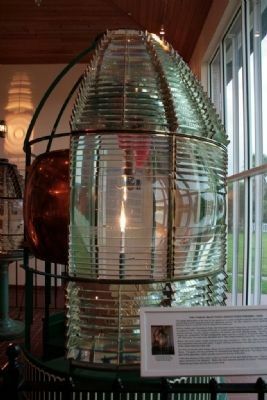 In 1946, the Mystic Seaport Museum in Connecticut contacted the Coast Guard about the possibility of obtaining a Fresnel lens. 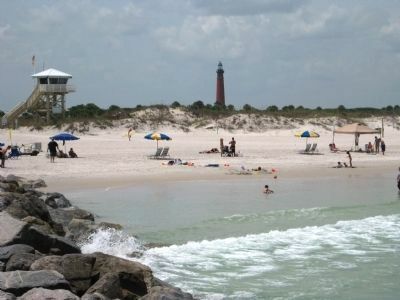 The Coast Guard determined that the First Order lens from Ponce Inlet would be suitable and the lens was shipped to them. The lens passed out of record and thought to be lost. After many years of searching by the Ponce Inlet staff, the original First Order lens was discovered in storage at the Mystic Seaport Museum. In 1997 the Coast Guard returned the lens to us on long term loan. 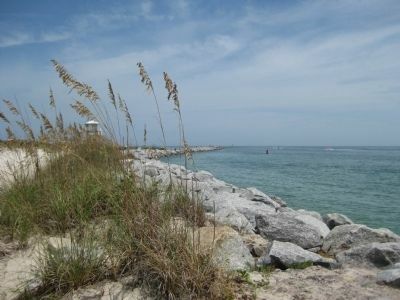 It has undergone extensive restoration by the Ponce Inlet Lens Restoration Team. 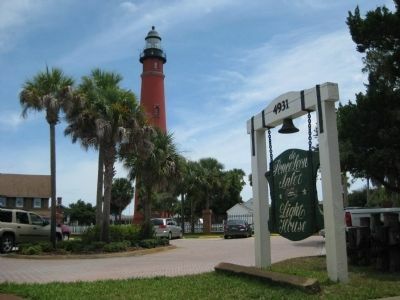 In 1933, the US Lighthouse Serice decided to change the characteristic of the Ponce Inlet Lighthouse from fixed and steady to a flashing light. 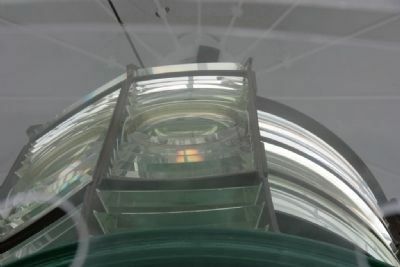 A rotating Third Order Fresnel lens with an electric light source was installed. When the lighthouse was decommissioned in 1970, this lens was removed and sent to the Coast Guard Academy Museum. 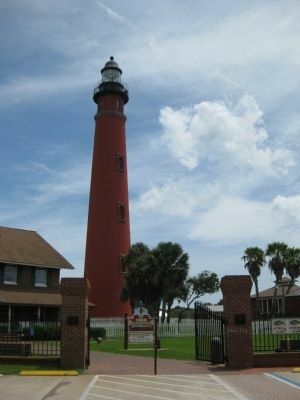 In 1973 the lens was returned to Ponce Inlet where it was completely restored. The tower was reactivated in 1980 with a modern marine aerobeacon as the light source. That beacon was destroyed by lightning in 1996, and a Vega VRB-25 with a rotating Fresnel lens was installed. 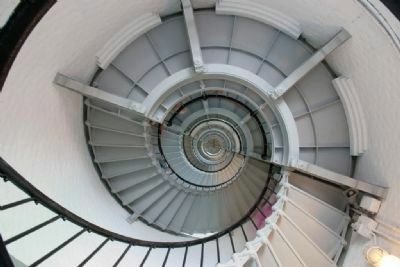 On April 30, 2004, the restored Third Order Fresnel lens was returned to service in the tower, and the lighthouse became a private aid to navigation. More. 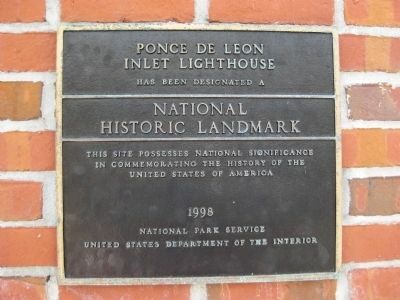 Search the internet for Ponce de Leon Inlet Lighthouse. Credits. This page was last revised on July 22, 2018. This page originally submitted on August 15, 2010, by Glenn Sheffield of Tampa, Florida. This page has been viewed 1,064 times since then and 3 times this year. Photos: 1, 2, 3, 4, 5, 6, 7, 8, 9, 10, 11. submitted on August 15, 2010, by Glenn Sheffield of Tampa, Florida. 12, 13, 14, 15, 16, 17. submitted on July 23, 2011, by Timothy Carr of Birmingham, Alabama. • Bill Pfingsten was the editor who published this page.